..."Bridget Mary Meehan, a bishop in the Association of Roman Catholic Women Priests, a splinter group that ordains women, said that while she loved Pope Francis, the media “had gone bonkers” in its adoration of him despite his doctrinal orthodoxy on women." Bridget Mary's Response: Pope Francis does not get the connection between women's equality n the church and in the world. The idea of justice for women in the institutional church, including women in equal decision making roles and the priesthood is a major threat to the Catholic hierarchy. Bridget Mary's Response: 70% of the world's poor are women and their dependent children, the church's condemnation of artifical birth control plays a major role in keeping women poor and pregnant. 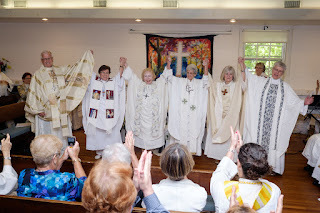 The Roman Catholic Women Priests Movement makes the connection between sexism in the church and poverty, abuse and violence toward women in the world. Pope Francis needs to recognize that women are the ones who are most marginalized, abused and oppressed in the world and that the church contributes to this tragedy by its policies of discrimination toward women in the church. "In a handsome stone Quaker retreat about a half-hour outside Philadelphia on Thursday afternoon, Ms. Meehan and dozens of other women in white robes sang hymns among signs reading “Women Priests Are Here” and “Archaeology Says Yes” (a reference to whether women served as priests and bishops of the early church)." Bridget Mary's Response: The Association of Roman Catholic Women Priests celebrated the ordination of 3 women bishops at this Ordination. Our first bishops were ordained by a male bishop with apostolic succession, therefore our orders are valid. We are disobeying an unjust law in violation of a man- made canon law 1024 that discriminates against women. The Catholic Church cannot continue to discriminate against women and blame God for it. The Risen Christ appeared first to Mary of Magdala and called her to be the apostle to the apostles. Women were ordained for 1200 years in the church's tradition. Pope Francis and the hierarchy of the church should follow the example of Jesus and the early church tradition. Bridget Mary's Response: There are 215 in the international Roman Catholic Women Priests Movement. We serve over 75 inclusive faith communities now. We welcome everyone to receive sacraments, the divorced and remarried, gays, lesbians, transgender, all on the margins of the church. The church that welcomes all must treat everyone as equals, not just those who obey the rules of the church. While Pope Francis has adopted a more compassionate, pastoral tone, he has not changed the toxic teaching of the church that excludes and punishes Catholics who follow their consciences. The Association of Roman Catholic Women Priests calls on Pope Francis to drop all excommunications and punishments against Catholics who follow their consciences, including women priests and our supporters. This would be a positive step toward healing the wounds of sexism and oppression of women in the church. Now is the time for Pope Francis, whom we love and admire for his social justice teachings, to embrace women priests whose mission is to serve a more open, inclusive church of disciples and equals. "Francis has no room for such women at the head of the table, opposing ordaining women and making women nonclerical cardinals, as was done in earlier times. “The church has spoken and says no,” he said in July 2013." While he has advocated a “deeper theology” about the place of women in the church and a “greater role” for women in its decision making, he has also said he believes such women suffer from a “machismo” that negates the real differences, and contributions, between men and women." Bridget Mary's Response: Feminists have been producing significant theologies on women's empowerment for 40 years. It is insulting that the Vatican thinks they should address a deeper theology, what needs to be addressed is the sin of sexism and patriarchy in the church. This is not machismo because women's rights in the church and in the world reflect our deepest realities as equal spiritual images of God who are human beings with full human rights! "In his homily Saturday morning at the Cathedral Basilica of SS. Peter and Paul, he spoke at length about women, but provided no opening for expanding their roles in liturgical life. He relied instead on appreciation for their current status and efforts, praising "the immense contribution which women, lay and religious, have made and continue to make to the life of our communities." Bridget Mary's Response: I thought that Pope Francis would affirm women as spiritual equals in the church and open a door to the full equality of women in all areas in our church. I was touched by his appreciation for women's gifts in ministry in the church, including the thousands of nuns who have labored for years to educate the children and youth of Philadelphia. I am grateful for my spiritual formation as an IHM Sister from 1966-1980. There is a long struggle ahead for justice and equality for women in our church. I am not discouraged because I believe Pope Francis may open the door to dialogue during this holy year of mercy. I hope that he asks forgiveness for centuries of sexism and opens the church to the gifts of women in all areas of church life including ordination in a renewed priestly ministry that is one with the people with whom we serve. May he have the courage to go where no pope has gone and transform patriarchal structures that continue to treat women as second class citizens in our church. Pope Francis has said that the church must not be afraid of change. As a woman of faith, I believe all things are possible with God! Women priests are here! Francis has no room for such women at the head of the table, opposing ordaining women and making women nonclerical cardinals, as was done in earlier times. Interview with Suz Thiel RCWP on Demonstration outside Synod on the Families in Phila. Support theindependentCatholic news source bringing you live coverage of Pope Francis' historic visit to the United States.Subscribe to NCR! 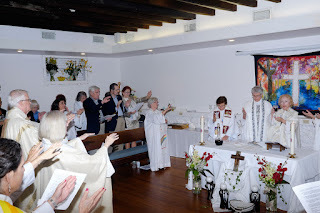 NETHER PROVIDENCE >> More than 40 years ago, when Bridget Mary Meehan was an Immaculate Heart of Mary sister teaching in Delaware County parish schools, she was forming the foundation that eventually led her to becoming a bishop with the Association of Roman Catholic Women Priests. Patti Mengers is a reporter for the Daily Times who writes health and religion issues. She's also a member of the paper's editorial board. Reach the author at pmengers@delcotimes.com .